“Ali knew more about them than anyone else did, including the bad stuff they wanted to bury – just like a body. It was horrible to think Ali might be dead, but . . . if she was, at least their secrets were safe. 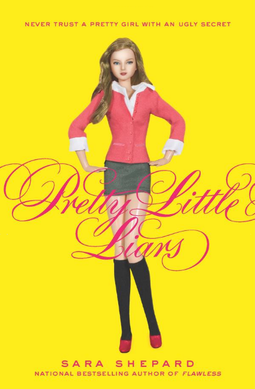 Sara Shepard’s Pretty Little Liars is about five girls, Alison (or Ali as the girls called her) Aria, Emily, Hanna and Spencer who all have deep and personal secrets. The story takes place in Rosewood, Pennsylvania, a suburban town where wealthy families live in giant houses with four car garages and manicured lawns. Alison is the Queen Bee at Rosewood Day, where even the eighth graders want to hang out with her even though she is in seventh grade. Ali’s posse runs the school and the girls all have very different personalities. The weird girl of their group Aria, has a pig puppet named Pigtunia that Ali constantly taunts her about, and knits all the girls mohair bras as Christmas presents. Emily is the sweetest friend a girl could want, as she is loyal and kind and all the girls can trust her with their secrets. Hanna is slightly overweight and very self-conscious, and will do anything to be skinny and beautiful. Even something dangerous. And Spencer is your typical smart rich girl. She is used to getting whatever she wants whenever she wants it and she gets straight A’s in school. Thsi is somewhat caused by the fact that Spencer has a vicious rivalry with her older, “perfect” sister Melissa in which she wants to come out at the top. In the summer before eighth grade, the girls were having a sleepover in Spencer’s barn in her backyard. Alison suggested that she try to hypnotize the girls. Spencer was hesitant and she opposed the idea. After all of the girls went to sleep, Aria woke up to find that Ali and Spencer weren’t in the barn. Aria stood up and looked around the yard but didn’t see anyone. She woke up Hanna and Emily and asked if they knew where Ali and Spencer went. Just then Spencer burst through the door. None of the girls knew where Ali was, but Spencer said she thought that she heard a scream. Since then, Alison has been missing. After Ali mysteriously disappears, the girls all started to receive scary text messages, e-mails, and handwritten notes about their deepest secrets that only they and Ali knew about, from an anonymous person who calls themself A. The girls believe that A is the person who killed Ali might try to hurt them too. The four friends will need to trust the friendship they have and use clues to find out who A is. Pretty Little Liars is one of my favorite series. It is action packed, and mysterious. Characters in the story are developed really well through thoughts and dialogue. For instance, Aria breaks through her shell when she spends time alone in Iceland. She has time to think some things over, and she starts a new chapter of her life. When they are faced with challenges, Spencer, Hanna, Aria and Emily realize that they still have each other. In the books, the chapters are in the different characters’ point of view which helps the reader see all of the girls’ emotions and feelings. I recommend this book to any teenagers who like to be on the edge of their seat, because this book is full of thrills and surprises. In conclusion, the Pretty Little Liars series is most definitely worth reading.